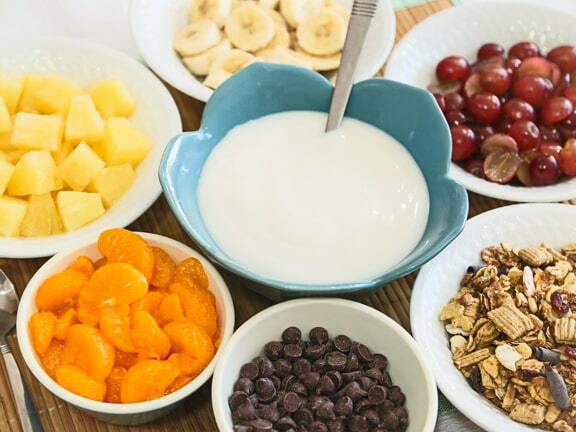 Bowls of nondairy yogurt, dried and fresh fruit, and granola can be a quick light lunch or nutritious snack. It’s great for kids — especially young children who balk at dishes in which ingredients are “touching.” But if they decide for themselves what’s touching what, they don’t seem to mind a mixed dish. When my kids were young and had friends over, they created patterns in their yogurt with the other items, and often asked for seconds. This is great for adults, too. Why let kids have all the fun? Photos by Evan Atlas. 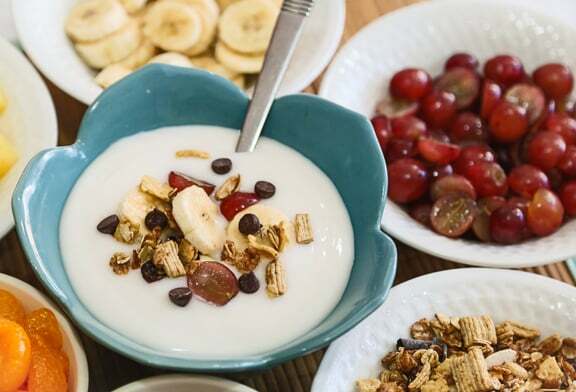 Bowls of nondairy yogurt, dried and fresh fruit, and granola can be a good breakfast, nutritious snack, or even a light lunch. 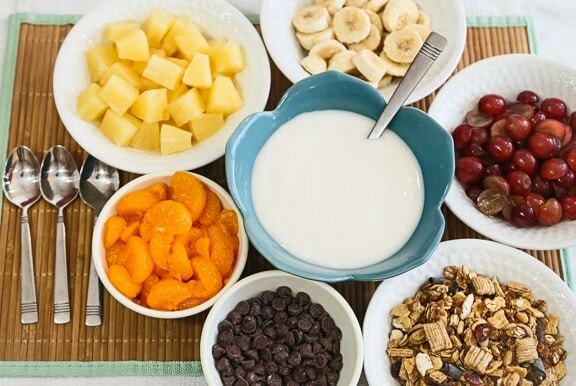 Place all the ingredients except the yogurt into separate, small bowls. Divide the yogurt among 2 to 3 individual serving bowls. Let everyone take a little of whichever ingredients they'd like to dress up their yogurt. Variation: During warmer months, replace the pineapple and oranges with sliced strawberries and blueberries. Here are more fruity compositions.